October 31, 2006 by Christoff Truter This post is closed for comments. I've recently accepted a position as a senior developer at Web Africa, can't wait to get started! Starting the 1st of December - having a HUGE battle finding a place to live though, tried to contact a few estate agents, without much success, didnt get replies... Sooo last night, I decided to send a picture to all of them. Gonna find myself a cozy little box!!! This is my story of how I became homeless. Long long ago, on a small little farm called Pretoria, lived an ambitious programmer (among a flock of afrikaans people),seeking the lights of the city. 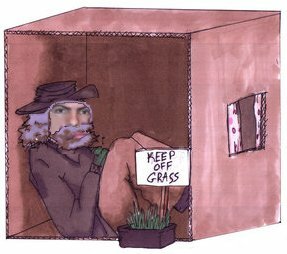 In his quest to rent a quaint little flat with at least 1 bedroom, a bathroom, kitchen, close to a bus route in melkbos, far far far away from chickens, but the evil rental agencies, didnt want to help him. In desperation he found himself a nice cozy snug lekker little box, which he parked next to a bus stop.